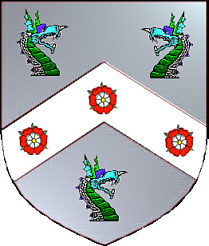 The Clark/Clarke surname implied a clerk, cleric, or clergyman and was recoginized by the MacPearson Clan. The name MacPearson means 'son of the parson'. and three roses on the chevron. Coat of Arms: A blue shield, with a gold fess between a gold castle in chief, and a gold crescent in base. 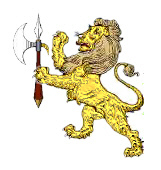 Crest: A blue lion rampant holding a battle axe. Motto Translated: In God have I trusted. The original meaning of Clark was ‘a man in a religious order, cleric or clergyman’. Merchants and tradesmen were called clerks. It is also thought that the surname might have derived from a nickname for a person who could read or write during the Middle Ages. The surname of Clark was also found as a sept of the Clans of MacIntosh and MacPherson. There are few Highland Clans of greater antiquity than the mighty Clan Cameron. While the Clan is known to be of a much more ancient origin, the earliest recorded chief is Donald Dubh, who, with the typical ferocious spirit of his Clan, fought on the side of the Lord of the Isles in the Battle of Harlow in 1411. The origin of the Cameron's name is said to derive from the Gaelic "Cam-shron" (crooked nose), which is believed to have been a nickname of an early chief, but over the course of centuries the name became more associated with an unquenchably fierce nature, than any physical attribute. "The term "clericus" was originally applied to someone in a religious order but it was later applied to anyone who was a secretary, scribe, scholar as well as a cleric in the church. It is therefore not surprising that this occupational name became widespread when surnames began to be used. At the end of the 12th century, a Roger clericus held land in Kelso and in 1249 Alan clericus was a witness to a charter in Aberdeen. There were nine people from Scotland with that name who signed the "Ragman Roll" when King Edward I of England demanded in 1296 that all landowners had to swear allegiance to him. However, it is only after 1400 that we can be certain that it was being used as a surname rather than as a description of someone's occupation or status. There was never a Highland clan of that name. However, it is frequently found among the Clan Chattan confederacy. Clarks appear to have been a sept (under the protection) of the MacPhersons (whose origins were also from the church, "Mac-a Phearsain" meaning in Gaelic "son of the parson" in the days when celibacy of the priesthood was not enforced). The name is common throughout the Lowlands and Highlands of Scotland. It is particularly prevalent in Caithness and there were important families of Clarks in places as far apart as Aberdeen, Edinburgh, Paisley and some have become landed families with baronetcies. Two unrelated Clarks reached high office in the Swedish navy in the 17th century and the name is found in Sweden and Finland in the form Klerck. The American explorer George Rogers Clark (1752-1818) was of Scottish descent. The tartan used by the Clerks is a variation of one called "Blue Clergy" which was worn by ministers, though it dates from the re-invention of tartan after the visit (orchestrated by Sir Walter Scott) of King George IV to Scotland in 1822. Clark is currently the 14th most frequently found name in Scotland. The name is also common in England where it is often spelt Clarke. Clark is regarded as a sept (sub-branch) of both Cameron and Macpherson.